Testing of Brunswick County’s raw and treated water at the Northwest Water Treatment Plant has found 1,4-Dioxane at 1.3 parts per billion in raw water but at less than detectable levels in treated. Testing of water samples taken by Brunswick County on July 5 show the presence of 1,4-Dioxane at the Northwest Water Treatment Plant, which draws water from the Cape Fear River, at less than 0.028 parts per billion (PPB), or less than the lowest detectible level, in the treated water, and at 1.3 PPB in the raw water. Testing of water samples taken by Brunswick County at the 211 Water Treatment Plant, which uses 13 wells to draw water from the Castle Hayne Aquifer, show the presence of 1,4-Dioxane at 1.3 PPB in treated water. According to the EPA, parts per billion and micrograms per liter are equivalent to each other, and each form of measurement is equivalent to one drop in 50,000 liters of water (13,208 gallons of water). “We are pleased with the results of the tests from the Northwest Water Treatment Plant as it shows that we effectively eliminated the 1,4-Dioxane to undetectable levels,” said County Manager Ann Hardy. These results from the Northwest Water Treatment Plant are 100 times lower than when water was sampled in 2015 as part of the EPA’s Unregulated Contaminant Monitoring Rule (UCMR3). The results from the 211 Water Treatment Plant are higher than the samples taken in 2015, but are still well below the EPA’s noncancer adverse health effect advisory of 200 PPB, which is calculated for consistent daily exposure over a lifetime to the most vulnerable populations, like infants. However, the results from the 211 Water Treatment Plant are above the concentration of 0.35 PPB, which represents a 1-in-a-million cancer risk, according to the EPA’s 1,4-Dioxane Technical Fact Sheet. The levels from the 211 Water Treatment Plant – 1.3 PPB – equate to a 3.7-in-a-million cancer risk level. This risk level was determined from animal studies. There are no U.S. regulatory maximum contaminant levels for 1,4-Dioxane. Brunswick County had no reason to suspect 1,4-Dioxane in the wells drawing from the aquifer, and is working to quickly locate and isolate the source of the 1,4-Dioxane in the water and determine appropriate corrective actions, including testing and reviewing processes. Brunswick County is also developing a plan for sampling of the source water as officials determine whether these results are a sampling anomaly. Staff is also working to determine why the number has changed from 2015, when the 211 Water Treatment Plant showed 1,4-Dioxane at 0.04 PPB. Map showing 1,4-Dioxane levels detected by NCDEQ research in different areas of North Carolina (click to enlarge). 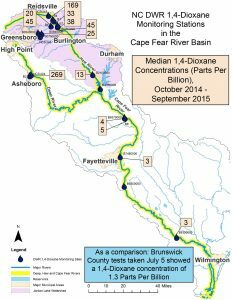 North Carolina Department of Environmental Quality is also studying the presence of 1,4-Dioxane at several sites upriver from Brunswick County where levels of 1,4-Dioxane have been detected, after DEQ officials detected it at 70 public water systems in North Carolina. 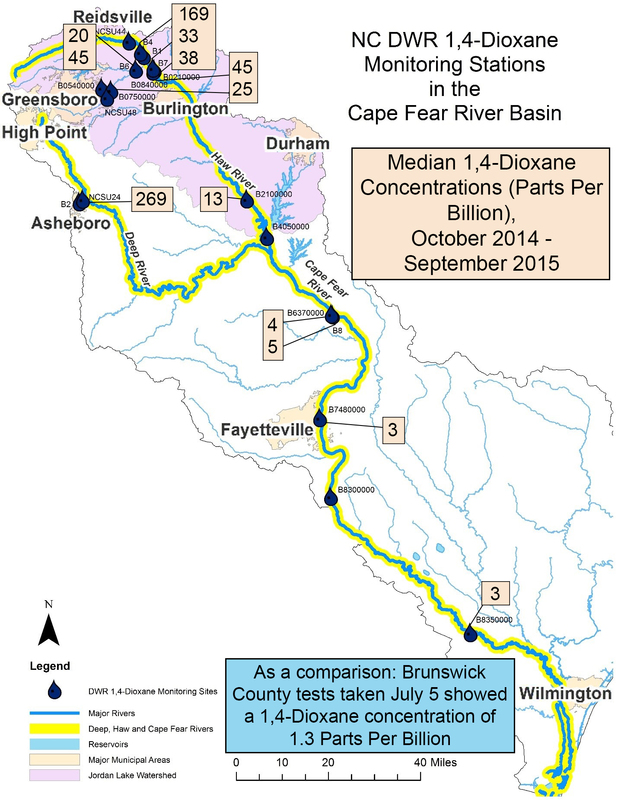 For more information about DEQ’s studies on 1,4-Dioxane, visit http://deq.nc.gov/about/divisions/water-resources/water-resources-data/water-sciences-home-page/1-4-dioxane. Brunswick County takes seriously its commitment to provide safe, quality drinking water, and provides water that meets all state and federal drinking water requirements. The County is committed to providing timely, accurate information to the public, and as we test and learn more about emerging and unregulated substances, information will be shared as it becomes available. View the full test results here.